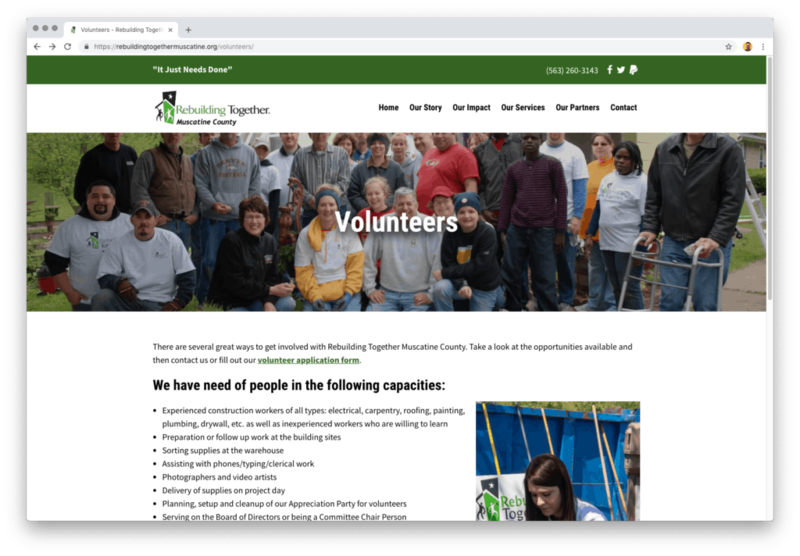 Rebuilding Together is a non-profit organization with branches in 146 cities nationwide that is dedicated to providing home improvement services to low income families. 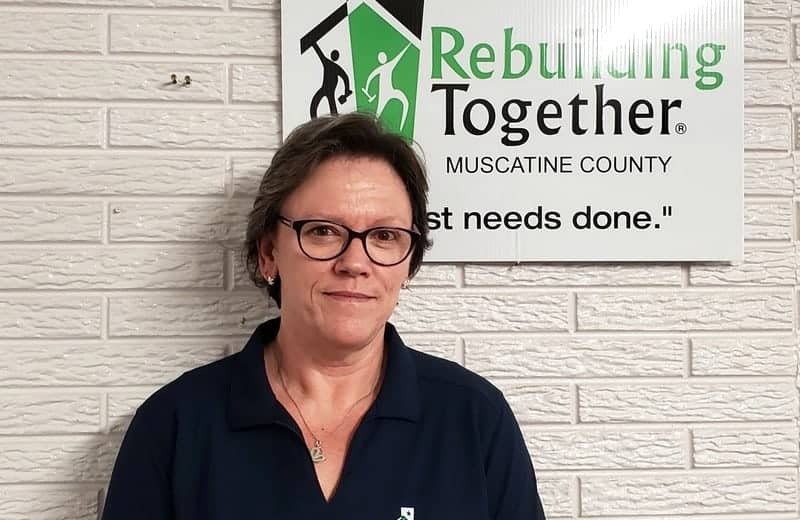 Deb Iliff and her husband Frank are the Volunteer Coordinator and Executive Director, respectively, of Rebuilding Together Muscatine County located in Muscatine, Iowa. They’re long-time clients of Big Imprint (in fact one of our first ever website clients, way back in 2010)! We got the chance to pick Deb’s brain about how she goes about managing non-profit volunteers and hear about the challenges she faces, how she overcomes them, and the valuable lessons she’s learned. Q: Can you give an overview of what the process of coordinating volunteers looks like? A: The first step is to get the projects lined up and figure out who needs what done, how many people we’ll need, and what roles will need to be assigned. After that, it’s time to start getting the word out and get volunteers. Then it’s my job to keep track of all the volunteers and get them assigned to the proper jobs and all that. There are always things that change as the projects approach and even on the day of. I do my best to coordinate everything, but really you have to just be ready for anything to happen. Q: How do you go about recruiting volunteers and spreading the word about volunteer opportunities? A: Word of mouth is huge for us. Often our work speaks for itself, as people are able to see the work we’ve done and the impact it has and it piques their interest in getting involved in the future. We also bombard social media when we have projects coming up, so a lot of people hear about us and our volunteer opportunities through social media. In addition to that, we also have corporate sponsorships with local companies, in which they allow their employees a day off to go and volunteer. We also do a lot with the local paper and radio stations, so there are a lot of different ways we make ourselves known to people. Q: How do volunteers sign up? A: There is a sign up sheet on our website. On this sheet people are able to select what types of jobs they want to do or are qualified to do. Not everyone can run a table saw, for instance, so it’s important for that form to help us filter out who can do what tasks. Once we get all the signups, we’re then able to plug them into the different projects based on their skills and preferences. We also utilize local connections like through our church and other churches who are nice enough to allow us to have a table in the lobby where we can tell folks about the opportunity to volunteer and we also have paper sign up forms there for them to fill out if they want. Otherwise they can go sign up online later. Q: What tools do you use to help with the organization and scheduling of volunteers? A: I’m techy, but I’m not high techy. We just use an Excel sheet with all the information from the sign up forms plugged into it. Right up until two days before the event, there is a table with Post-it Notes where I have people’s names and jobs written on them. Then as we get closer to the day, I move the Post-its around to the different jobs to assign people to the proper tasks that line up with their skills and interests. You can always count on a 40% walk-up, meaning people who didn’t sign up or anything beforehand, they just show up and want to help out. So for those people, we have personnel available to help them get the waivers filled out and then they come back to me and ask for a placement. Excel sheets and Post-it notes—not a highly sophisticated system, but it works well for me! Q: What have you learned about managing volunteers that you wish you would have known earlier on? A: People will always tell you “yes” but a lot of times they don’t come through. We’ve had dozens of people say “yes, we’ll be there, you can count on me!” but then they don’t show up because it’s too cold, too hot, or something else came up. People can be fickle and life happens sometimes, so often we’re left in a situation where we have to try and overcome the absence of volunteers. It’s my job to, as best I can, make sure the volunteers understand how vital their help and effort are. It’s so important to tell your story and to get people to “buy in” to the vision of what your organization is trying to do. Make sure that people understand why they’re volunteering, because if they don’t feel like they are making a difference, then they’re not going to be dedicated and there’s a higher chance that they won’t come through. Q: What mistakes did you make early on that you would warn others about who may just be getting started with volunteer management? A: Start earlier. Don’t start preparing for projects just two weeks in advance. These things take twice as long and cost twice as much as you think they’re going to. Each year we come up with a better list consisting of what we did well, what we could have done better, and things that we should never do again. We always debrief and learn how we can be better in the future. In addition to that, as a volunteer coordinator, it’s incredibly important to talk to people and ask for help. Always be willing to ask for feedback and suggestions from people, and seek out helpful resources or other people with experience and ask for their advice. It’s so important to start early enough that you can prepare for all the little details and get as much help from people as possible. Many thanks to Deb for taking the time to talk with us! Non-profits may have a variety of revenue streams, but one of the most prevalent across all types of non-profits is private donations. Much of the donations that non-profits receive anymore are through their website, so we wanted to discuss was to go about increasing non-profit donations online. Now, unless you have some very faithful check-senders, chances are good you either have an online donation option available, or you’re soon going to have it available. Whatever the case may be, once you have an online donation option in place, that’s just the beginning. It’s not enough just to have it there and to expect money to start flowing in – you need to continue to take action to promote continued giving, as well as new first-time giving. Once someone gets to your website, make it very easy to find the donation page (for instance, have the “donate” button placed on every page of the website). But once someone gets to the donation page, the process of giving needs to be really simple. You want to eliminate any unnecessary barriers that might cause them to hesitate, procrastinate, or in the worst case scenario – just give up and leave your site. The donation form should be clean and easy to fill out, and should never take the user off of your website. This makes people feel like their money isn’t actually going to your organization and is just not professional. Make sure the donation portal is embedded within your site so that the giver never has to leave the site or question where the money is going to end up. People like to know what exactly their money is going to be used for. If they’re about to give to your organization, chances are good that they’re pretty supportive of whatever it is you do, but it’s always good to just lay out what exactly their money will be going toward. It’s also very strong to show what past donations have gone to as well, so they can “quantify” the impact of their giving, in a sense. For instance, a sentence saying, “Last year, we received x amount of money in donations from people like you, and with that, we were able to serve x many people.” This helps people envision what exactly they are contributing to when they give you money. You’re more likely to successfully get them on board when they feel like they’re part of a solution to a problem. This goes back to the simplicity point, but it also has to do with basic psychology. It’s easier for people to click an amount than type in a custom amount themselves. Plus, if you put multiple options, then people who were going to type in a number lower than your lowest option will often opt to just click the lowest option instead. Boom – you just got more money from them. It’s good to test out different amounts as well. Perhaps on occasion you want to try increasing each amount by $5. Or maybe you see what happens if you eliminate the lowest option. It’s worth testing to see what people do. If you can get more money from your donors simply by making minor changes to the default options, then by all means try it! This is a feature that you hopefully have if you already have a donation portal on your website, but if not, you should talk to your website folks about adding it. When people donate on your site, you should absolutely have an option available for them to make it a recurring gift. 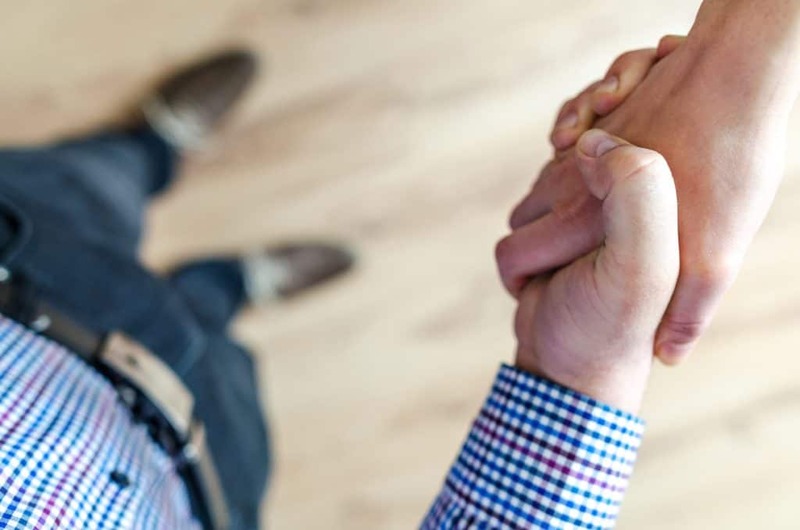 If they’re passionate about your organization and your mission, chances are good they want to partner with you on a regular basis, as opposed to just a one-time gift. If that’s the case, then you’re leaving much-needed money on the table by not providing this simple option for them. Make sure you allow those who want to give monthly or yearly the opportunity to do so! The best marketing is word of mouth, and the best word of mouth channel is social media. When folks get done submitting their info and their donation, you should have a social sharing button available. This will allow folks to quickly share via Facebook or Twitter that they just donated to your organization. The goal here is to organically spread the word about your organization in order to increase awareness, drive traffic, and ideally convert more people into active contributors of your organization. If someone sees their Facebook friend is passionate about your non-profit, then they’ll likely be curious and decide to check you out as well. Hopefully you find these ideas helpful as you look to increase donations on your non-profit’s website. We care about non-profits and love working with them. If you are a non-profit in need of web design help, we’d love to chat with you! In today’s world, with so much information at our fingertips, we as a human race have grown less and less patient. We’re used to being able to hear the songs we want, watch the shows we want, and check the scores we want – and all it takes is a swipe, tap, and touch of a screen. As a business, adapting to this on-demand world is critical, and one of the ways that more and more businesses are becoming more on-demand for their customers is through live chat softwares. As you can see from the box in the lower right corner of this very webpage, or any page on our website, we are fans of live chat. When customers or prospects visit a company’s website and have questions or need help, it sends a powerful message to them when the company can be there to answer them and chat with them, much like people are used to chatting with friends via Facebook messenger or iMessage. There is data out there that supports this idea as well. In fact, 77% of customers in a recent study said that they won’t even make a purchase on a website if there’s no live chat support. Additionally, 42% of customers said they prefer live chat as their digital contact method vs. just 23% for email and 16% for social media. Not only do your potential customers want you to have live chat on your website, but it actually makes it more likely that they’ll become your customers if you have it available. 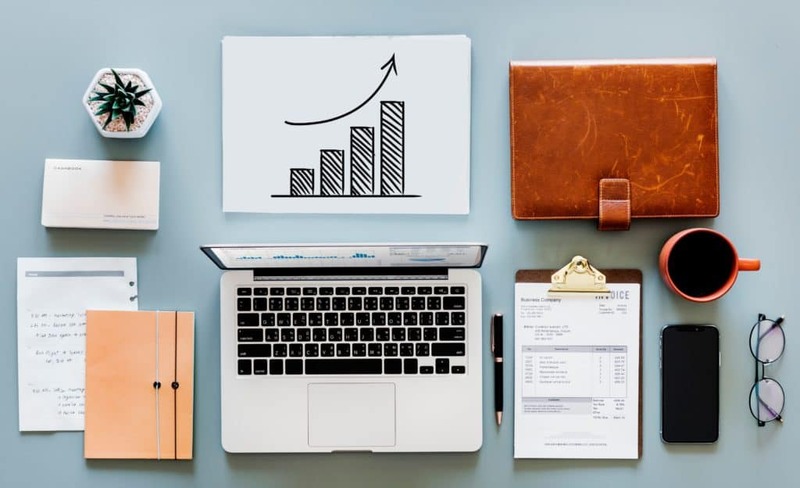 The thing is, there are multiple different live chat software out there that you could possibly use – so we’ve compiled a brief list of them for you here with a breakdown of their pricing and main features. Main Benefit: The integration with your sales process. Not only does it benefit your sales team by allowing them to engage with customers in real-time, but they go beyond that initial interaction as well by allowing for automated chat sequences, automated email sequences to follow up the chat, email tracking, and even a meeting scheduler that your team can link to from their emails so prospects can book a meeting with a salesperson with a few clicks! Main Benefit: The beauty of Olark really lies in its simplicity. While Drift has a lot of in-depth functionalities that are great once you have them all configured to meet your needs, Olark meets most of the needs for businesses simply looking for a live chat solution. They do offer integrations with whatever CRM you use, so even though it may not have the automated email sequences, it still will allow for your sales team to easily keep track of them and contact them in the future. Main Benefit: HappyFox prides itself on its speed and the slick customer history dashboard that gets presented when a previous customer comes back to the website and chats. The dashboard immediately shows all chat history so that your representative can easily refer to the previous chats to help solve their issue or answer their specific questions as quickly and accurately as possible. Much like Drift, HappyFox is a very in-depth tool with a lot of functionalities you can get into, but you can also simply decide to make use of only a few features if you don’t have need for all the bells and whistles. Consumers expect to find live chat on your website almost as much as they expect to find your phone number or email address. It’s simply becoming more and more of a staple of modern business practices, and if you’re the type of company that relies on personal communication with your customers through the sales process or even in your support processes, having a live chat option can really set you apart and help you serve them well. Hopefully you check out some of our suggestions and find them helpful! 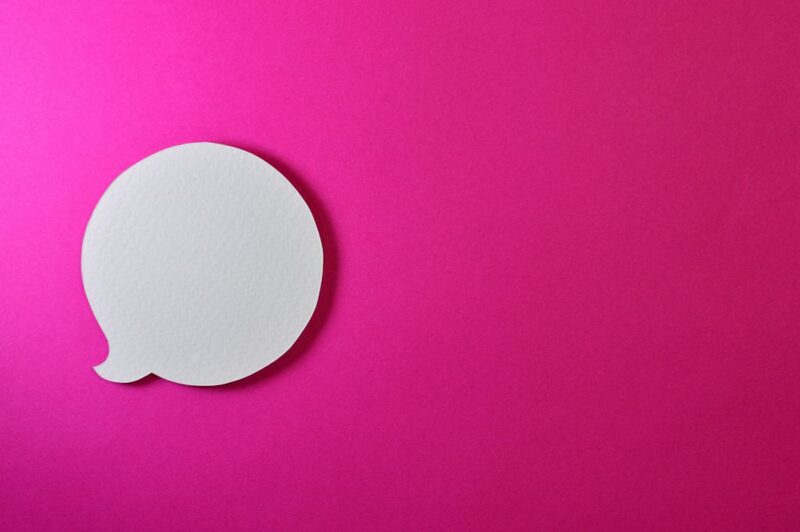 If you have other chat system recommendations, feedback on this article, or would like to ask us more questions about the options above, please feel free to contact us at hello@bigimprint.com, or simply talk to us via our live chat option. We’re always happy to chat! 2018 is coming quickly to a close, and as the end of the year approaches, it’s a good time for you to consider non-profit giving (if you haven’t already). Hopefully at some point this year, you have given to a non-profit in some capacity, be it random donations, membership dues, or your time and energy by way of volunteering. Giving monetarily before the end of the year has multiple benefits, both financially and otherwise. We’re here to not only remind you to kick your non-profit giving into gear, but also to recommend some lovely non-profits we know who could really benefit from and appreciate your generous donation. 1. What’s in it for me financially? Well, for starters, donations to registered 501(c)(3) non-profits are tax deductible, so you can reduce your taxable income with every donation. Ron Swanson of Parks and Rec has his own line of reasoning behind disliking taxes, and whether or not you agree with his thinking, most would agree that it’s nice to have more control over where your money goes. By giving to non-profits, you can write off your donations, thus reducing the amount that you have to pay taxes on at the end of the year, and ensuring that the money goes into the hands of the people or causes you care about. 2. What else is in it for me? Aside from the financial benefits, there are plenty of intangible benefits of non-profit giving as well. Have you ever lended a hand to someone in need? Perhaps you’ve helped an elderly person carry their groceries, or paid for the car behind you in the drive thru, or maybe you successfully suppressed a laugh when a stranger slipped on the ice in front of you (this is a low bar to clear, but I’m trying to be inclusive here). The point is – what sort of feeling do you get after doing a good deed? It’s typically very fulfilling and rewarding! That’s what it feels like to give to a charity. When you’re generous and help others, it makes them feel good and it makes you feel good. Plus, if you have kids, leading by example in your generosity will instill in them a desire to be generous and helpful to those around them, which is a mindset that seems to be dwindling fast in today’s culture. Keep the giving going, and promote generosity in yourself, your community, and your family. 3. Fine, you win. Who should I give to? We hope you’ll consider giving generously to one of the above non-profits, or to any other non-profit of your choice. ‘Tis the season of giving, after all! 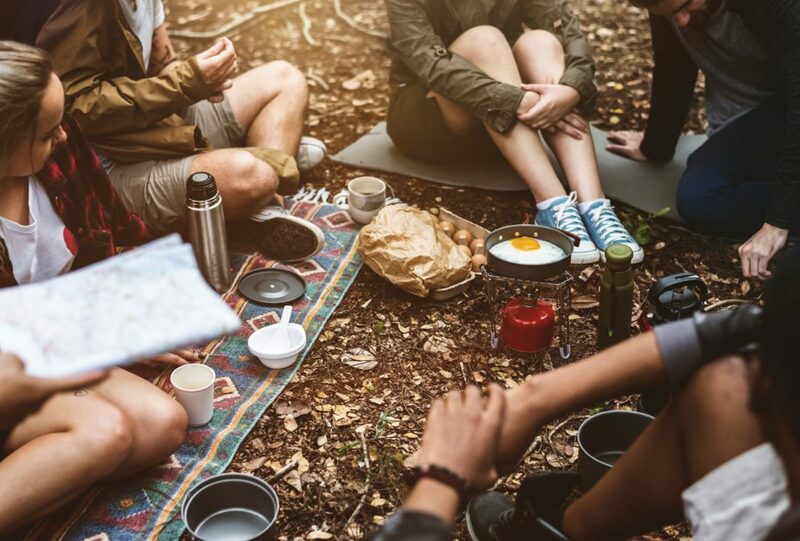 We recently conducted a case study of our client, Camp Bangarang, where we were looking to learn from them what it was like while they were starting a non-profit. Camp Bangarang provides a fun, empowering, and completely free camp experience for children with life-threatening illnesses and their families, all across the Midwest. We wanted to find out what led Camp Director Mark Sigel to start this non-profit camp, and how he went about it. Below is our Q&A with Mark, in which he tells his story and offers advice to anyone who may be thinking of starting a non-profit. Q: What inspired you to start Camp Bangarang? A: I was diagnosed with muscular dystrophy as a teenager, and I attended camps for kids with diseases and found it really helpful. I then volunteered at these camps and ended up working for the Paul Newman-founded Serious Fun Network of camps for about 8 years. When a close friend of mine’s child also was diagnosed with a disease, they were looking for a camp to go to, but the nearest one was in Colorado. That’s when I started thinking about how we could possibly make these camps more accessible for folks in the Midwest. Q: What initial steps did you need to take in order to get this off the ground? A: Well, I definitely didn’t know what I was doing. I had always worked for established non-profit organizations, so the process of starting a non-profit was completely foreign to me. I’m a camp guy – so when it comes to archery, I’m your man – but the business side of things I knew I really needed help with. I recruited some great help from people I knew in various fields including a CPA, an investment broker, a firefighter with board and management experience, and a lawyer. These people serve on our board, and they are vital to this organization. The steps we had to take were to file with the state and IRS so we could get the tax exemption status. Plus we knew we would need to raise some funds in order to get some key things like a website to attract attention and spread the word, as well as a camp location to rent so we could conduct our own camp, because purchasing that much land this early is too cost-prohibitive. Q: What surprised you in the process? Was it easier or harder than you’d anticipated? A: The process overall wasn’t very surprising to me, because I think my anticipation of what it would be like ended up being pretty accurate. These days, there is so much material and so many resources out there that you can learn a ton about nearly anything, so I had done a lot of looking into what the process of starting a non-profit would be like and I felt prepared for it. The one thing I will say, however, is that it takes a long time when you’re dealing with paperwork and the state. If you get “gung ho” and decide to go for it, don’t expect it to be a one-month, quick process. You need to have a deep passion for it and a patience to see it through. Q: What was the greatest struggle you faced? How did you overcome it? A: The greatest struggle we’ve faced so far, and probably a common struggle when starting a non-profit, is simply getting the word out about who we are and what we do. When applying for grants and whatnot, we face a much steeper climb than United Way or these other big non-profits. We’re constantly having to explain what we do so we can get funding, support, and of course camp attendees. The ways we’ve overcome this is by taking and seeking every opportunity to tell people about it. We attend all sorts of public events and meetings, from having a vendor booth at conferences, to making appearances at local Rotary Club meetings. We were also fortunate to have a billboard spot donated to us, so we’ve been able to utilize that as a way to catch more eyes. We’ve even reached out to a lot of the local news and radio stations, and they’ve allowed us to come on their programs to talk about the camp and our mission, which helps drive more traffic to the site and gain more awareness. Q: What was a great point of success? What/who helped make that happen? A: The initial fundraiser was a huge success for us, as we were able to double our fundraising goal – we held public picnic that consisted of a raffle and a silent auction. The other big success was our first camp, which we held in October 2018. The kids had a blast and were all safe, and the parents want to bring their kids back, which is a great sign! I always am looking for ways to improve, so I’m sure things will change and get better, but it was a really great first camp. The credit for this success goes to my awesome board of directors who have volunteered their time and skills to this. Plus, all the people who have donated are a incredibly important, considering it’s a free camp. Oh and our volunteers for the camp were incredible. We had volunteers come from all over the midwest and even fly in from California and Ohio. Q: What advice do you have for other people out there who are thinking about starting a nonprofit? A: If you’re just starting a non-profit, you have to do your due diligence and see if anyone is already out there doing what you want to do. You don’t want to get too married to the idea that you decide to pursue it despite the larger, more established organization 50 miles away that has the same mission. If you’re passionate about a cause and there is someone else out there doing it, then you should see how you can come alongside that group and help them, rather than try and start your own competing non-profit. Q: What tool has been the most helpful to you? A: Well most people, myself included, when they hear about something and want to learn more about it – the first thing they do is google it and find the website. I knew that a website was going to be one of the first things we’d need to get up and running so that we could have a professional face to our organization where folks can come to learn more. We had a good idea of what all we wanted included on the website already, and we brought it to Big Imprint, and you all did a great job executing on that and have been great to work with ever since. Please take a moment to visit Camp Bangarang’s website and learn about the important work they’re doing (and maybe consider donating! ).